The always exciting world of competitive Donkey Kong playing has a new champion once again, with a familiar bearded face. 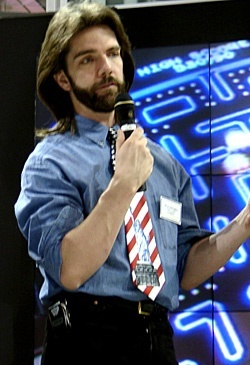 King of Kong co-star Billy Mitchell has reclaimed the Donkey Kong high score world record once again as of this weekend. The latest battle for the record popularized by the 2007 documentary has been won by the shiny-haired hot sauce entrepreneur for now. Though the Donkey Kong record was once a back-and-forth between Mitchell and other King of Kong co-star Steve Wiebe, a surprise challenger appeared in March that held the record until yesterday. Hank Chien's previous record of 1,061,700 points was broken by Mitchell at Iowa's International Videogame Hall of Fame with a referee-verified score of 1,062,800. But that's not all. The ever-confident Mitchell also broke the world record for Donkey Kong Jr. on the same day. Steve Wiebe held the title's record as of February, which was broken in April, but now again overruled by Mitchell. Mitchell was only planning to take care of Donkey Kong, but says: "I remember a lot of celebration; hugs, kisses and a lot of hooting and hollering. Once that died down, stood there looking at Donkey Kong Jr. and thought 'there's one more thing I have to take care of'." And he did. While Mitchell gets a bad rap for being overly arrogant (just watch King of Kong to see what I mean), he says that's just his way. Mitchell actually stopped playing as soon as he beat Chien's Donkey Kong record, instead of trying to get an even higher score. He said: "Some say I'm being cocky. Some say I'm being lazy. I say, I'm being Billy Mitchell." Whether he's cocky, arrogant, a total *****, or just a smart competitor, one thing's for sure: The man has great hair, and that counts for a lot these days.